During the post-war years, in Mortain, he noticed that priests were tending to blend in with the world and to lose their priestly identity. Vocations, or rather the number of responses to God’s call, began to decrease; in the seminaries the theologians currently in fashion were replacing St. Thomas Aquinas; liturgical experiments were desacralizing the sanctuary; young priests were too often behaving like community organizers. If the salt of the earth loses its flavor, with what can it be salted? At first he was content to send those young candidates to the French Seminary in Rome. Alas, liberalism already reigned there. But in 1968, relieved of his responsibilities as Superior General of the Spiritans, he could take action. That was a first sign from Providence. The University of Fribourg in Switzerland, run by the Dominican Fathers and faithful to St. Thomas, was a temporary solution. His friend Professor Bernard Fay, an historian and specialist in Freemasonry and the French Revolution, invited him to visit him at his home, along with Dom Bernard Kaul, the Cistercian Abbot of Hauterive and Dominican Fr. Marie-Dominique Philippe, a professor at the university. On June 6, 1969, the Bishop of Fribourg welcomed his friend with open arms. They had become acquainted in Dakar when, in order to thank the Swiss Catholics for their generosity, Marcel Lefebvre had invited the bishop to bless the brand-new church of Fatick. So it happened that on October 13, 1969, nine recruits appeared at Rue de Marly, where Archbishop Lefebvre welcomed them. He was alone, because the priest on whom he had counted to serve as rector of the seminary let him down at the last moment. Providence decided that the aged archbishop and apostolic delegate, having reached retirement age, with no certainty whatsoever about the future, would start from zero and found a seminary by himself and all alone. So it was that every evening, after their courses at the University, in the intimate setting of the humble community room in the Don Bosco House, Archbishop Lefebvre explained to his novices the rudiments of the spiritual life: Jesus Christ, His sacrifice, the Mass, the priesthood. "I cannot in conscience leave these seminarians orphaned!" In front of the statue of St. Pius X at the Seminary of Econe. 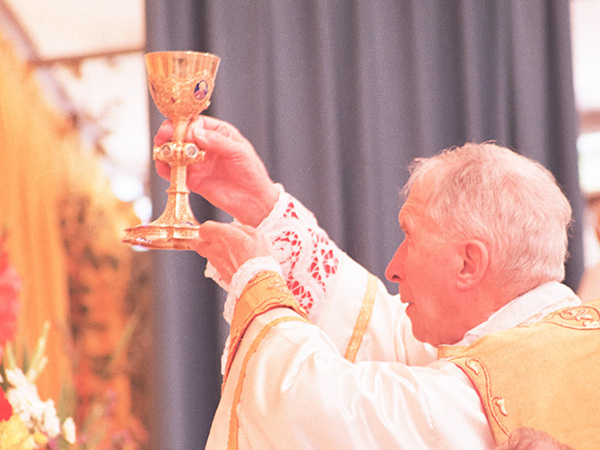 "The whole point of the Society is first and foremost to sanctify priests, to give the Church holy priests."